There are sharp partisan differences over the impact of a possible government shutdown on the economy. One divide is between the parties: 71% of Democrats say a government shutdown would have a major effect on the economy, but only 51% of Republicans agree. Among the overall public, 61% predict a shutdown will have a major impact while 30% say the effect will be minor. But as has been the case on a range of issues, particularly in the GOP-controlled House, there are also markedly different views among Republicans who align with the Tea Party, and those who do not. Tea Party Republicans, who pressed House Speaker John Boehner to take a hard line on the party’s budget stance, are far less likely than non-Tea Party Republicans to see dire economic consequences if a government shutdown results from an impasse. A Pew Research Center survey conducted Sept. 19-22 found that 39% of Tea Partiers believe a shutdown would have a major effect on the economy compared to 60% of non-Tea Party Republicans — a difference of 21 percentage points. 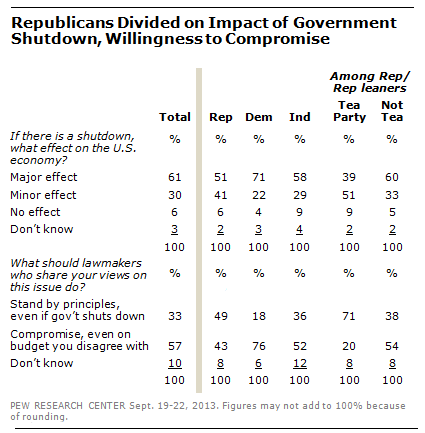 Tea Party Republicans are also far more likely than non-Tea party Republicans to say lawmakers should stand by their principles even if it means a government shutdown. About seven-in-ten (71%) Tea Partiers holds that view compared with 38% of non-Tea Party Republicans. (Over half — 54% — of non-Tea Party Republicans say lawmakers should be willing to compromise even if it’s on a budget they don’t agree with. Nearly nine-in-ten (87%) Tea Party Republicans favor the House GOP budget bill that would defund the health care law, compared to 61% of non-Tea Party Republicans.